An article in Reuters covering the reaction to California's overturn of its foie gras ban - a piece that has been replicated throughout the media landscape - made a critical and very common error. 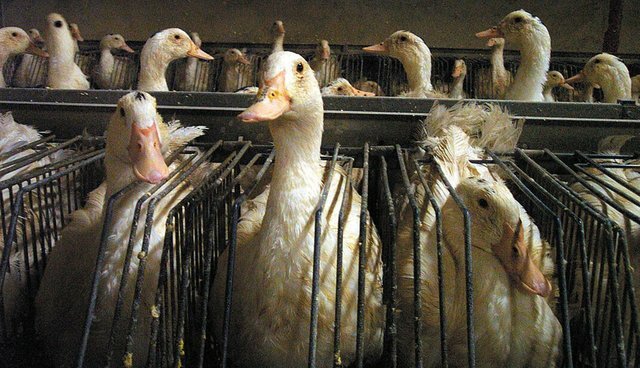 The writers explain, "As chefs in California hurried to stock their kitchens with newly legal foie gras, animal rights activists on Thursday protested a federal judge's decision overturning the state's two-year ban on sales of the fatty liver of ducks and geese." The term I want to highlight here is "animal rights activists." It is all too common in the mainstream media to characterize all opposition to animal cruelty as the exclusive work of this small segment of a much broader network of animal advocacy. The problem with the term is, in part, that it carries a strong whiff of extremism. If the reaction was, in fact, radical and limited to self-identifying animal rights activists, the use of "animal rights activists" would be appropriate. But journalists need to recall that a majority of Americans are concerned about animal welfare. It's thus, in this case, disingenuous to suggest that only a group of extremists were concerned about force-feeding ducks three times a day to fatten their livers. Numerous other reports validate the extent of that opposition. Writing in The Guardian, Samantha Gillison, a self-described "unabashed omnivore" opposes the ban's overturn. She explains, "I sincerely hope Attorney General Kamala Harris fights to get the ban reinstated," noting how, "The price of getting to live among our fellow humans in a truly civilized society is that we have to repress some of our urges."